There is an emerging generation of Asian Buddhists in the West and beyond, comprised of vocal young adults fluent in the language and currency of the West, but who refuse to be limited by it. 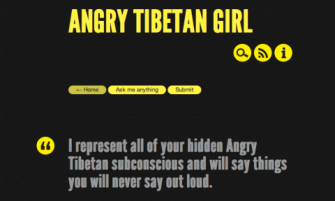 And among them is the Angry Tibetan Girl. You might have missed it, but there is a youth blog for the voices of young Tibetans. I couldn’t believe it when I found it. Thanks for the suggestion about @djbuddha - now following. BTW nice interview over at Jizo Chronicles!